Antalya, city on the Mediterranean coast of south-western Turkey, is the Turkish capital of international tourism. Antalya is a tourism destination characterized by a Mediterranean climate with hot, dry summers and fairly warm and rainy winters, one of the reasons why increasing numbers of tourists are turning to Antalya not only as a summer destination but also as a winter vacation resort. Once you have tasted the Antalya cuisine, the flavour of the spicy Piyaz or of the many cold Mediterranean dishes with olive oil will get stuck on you forever, and no matter how hard you try to cook it at home there will always be a secret ingredient that you miss... the flavour of the places or the flavour of the local colour that people have learned to use in their dishes. Apart from its cuisine, Antalya also boasts about golden beaches (Konyaalti and Lara) and foaming milky waterfalls (Düden, Manavgat) which are chief tourist attractions added to the list of reasons why people choose this vacation destination for the first time or come back here ever more. The city of Antalya seems to have taken in all of Turkey’s cultural and historic past so well preserved and sealed by the traditional archaeology of the mosques, churches, madrasahs and hamams which stood the ruthless test of time. The historical part of the city, Kaleiçi, is also the tourist centre of Antalya: hotels and clubs, restaurants and bars are the edifices that the modern tourist world has raised next to the Yivli Minare, a symbol of the restored historical city centre and to the Kesik Minare, a former Byzantine Pangalia church, later converted into a mosque. 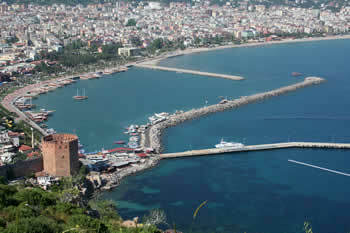 Despite Antalya’s growing popularity among tourists, the main transportation here is by air, although sea and land routes have only recently been taken into consideration. However, of late, the International Antalya Airport has opened a new terminal to face the hustle and bustle of the ever increasing numbers of international tourists. The whole urbanized Antalya transportation system makes it easy for its tourists to move from one place to another and visit all the sights they want, while still preserving their energy for the grand tour of restaurants and bars. Thus, they can choose from tour minibuses that follow a set route, taxis, or trams so that a tour day at the Antalya Museum can be ended by a walk in the Antalya Beach Park or on the shore of the Konyaalti Beach. Likewise, they can get out of their hotel (either luxurious like Sheraton Voyager, Falez Hotel or inexpensive but comfortable) along the coast, just above the Konyaalti and Lara beaches, get on a tram, and get off at the city centre, with its streets crammed with old Turkish and Greek houses. The legendary Turkish baths, the spicy foods, the colourful gift shops, the noisy streets and bars packed with other euphoric tourists, just like you, the historical traces preserved into Hellenistic, Roman, Byzantine or Ottoman edifices, the Antalya festivals all are reasons why you should at least once in a life time indulge yourself with this Heaven.